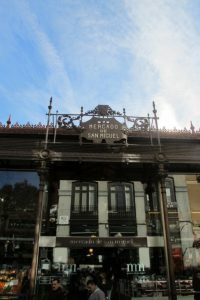 In Madrid, tapas bars can be found at every street corner and are still very successful, even in times of crisis. Tapas, the small dishes you can eat all day long, are typical for Spanish culture. They bring people together and have always played an important role within the social life of Madrileños. And although the cultural tradition continues, the tapas change all the time. ‘It is our culture to share food at the table’, says Joaon (38), a Madrid local. Tapas are a part of the social tradition of Spanish people. Today, the serving of tapas is still designed to encourage conversation, because people are not so focused upon eating an entire meal which is set in front of them. 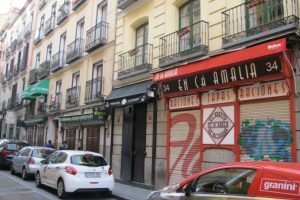 Madrid has endless tapas bars: every bar has its specialty which stands out among the others. It is very common among locals to walk around the city and go from bar to bar. 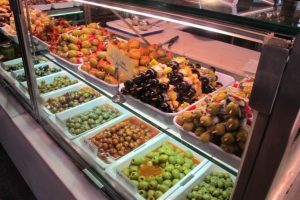 If locals are planning on visiting more than one tapas bar during the evening, this is sometimes referred to as ir de tapas. This way they consume an entire meal of different tapas. A tapa was, and still is, a small portion of any kind of Spanish cuisine. Tapas are served to accompany a drink. The size of the dish is important to define if something is or isn’t a tapa. Originally, tapas just to be served to customers without charge when they ordered a drink. The idea behind this is that by serving salty snacks, customers are more likely to drink more to quench the thirst provoked by the food. In addition to the traditional tapas, pintxos are also very popular in Madrid. A pintxo is tapa served on a slice of bread and held together with a tooth pick. 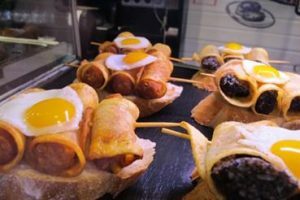 Bars will rarely offer pintxos in combination with tapas. This is because pintxos aren’t free of charge. 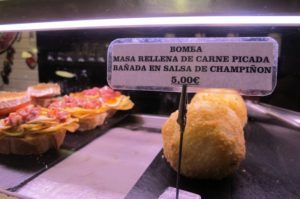 The price of a pintxo varies from one to four euros. The original tapas are a little more expensive, depending on what you order or how fancy the bar is. The price can go from five to twenty euros. ‘Both pintxos and tapas are really popular in Madrid, we go from bar to bar to get the best tapas in every bar’, says Bernardo (22), a waiter of tapas bar El Tempranillo. It is important that tapas are renewed to remain interesting for customers. New flavors often blend with traditional ones to create modern tapas. To keep up with the recent trends, dishes have become a bit larger, opposed to the bite-sized tapas. Nevertheless, the concept of sharing still remains really important. Innovative dishes which stand out keep the tapas culture alive in Madrid. 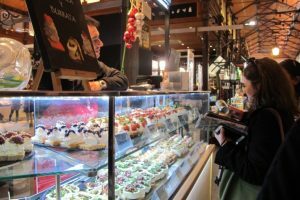 Tourists also love to have a taste of the Spanish eating culture. 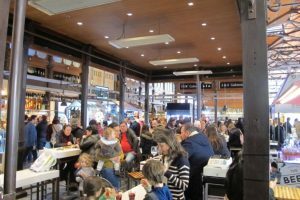 Mercado San Miguel is one of Madrids’s oldest markets and is a paradise for foodies, tourists and locals who love tapas. “The food market offers the most popular tapas from all over Madrid. This place has it all”, says Juoan. Besides traditional tapas such as croquetas, olivos and jambón they also offer Spanish tapas with a contemporary twist. In Spain, tapas are so established that it is even included in the Spanish language. For example, tapear is a verb specifically meaning to have tapas, while picar means to pick at and is used to describe the way you would eat finger-foods. Ir a tapear (going out for tapas) in Madrid can be a daily occupation among Madrileños, the people from Madrid. There are some myths that explain the emergence of tapas. One of the best known dates back to the 13th century. King Alfonso X, who was called The Wise, had to eat small portions of food alongside his drink to diminish the effects of alcohol. Afterwards he insisted people should serve a small portion of food alongside the drink to prevent public drunkenness. 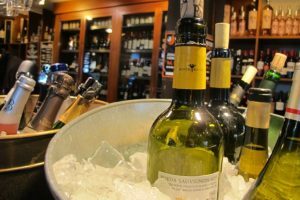 Another story emerged in the 19th-century when King Alfonso XIII ordered wine in a popular tavern in Cadiz. The wine was served with a slice of ham on top of the glass to keep the sand out. The king enjoyed the combination of the ham and wine so much, he ordered it again and started a trend. The word tapa here translates as ‘cover’. In other words, a complementary piece of sliced ham served on top of a glass of wine may have been the first traditional tapa. Wine is the most popular drink in tapas bars. 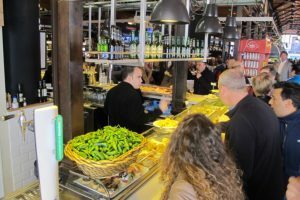 By keeping the tapas culture alive and evolving, Madrid will keep on attracting a diverse public in the city. 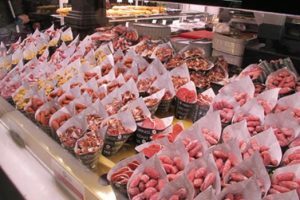 Furthermore, the tapas culture will keep having a positive effect on the locals who attach great importance to traditions, but also feel the need to keep up with innovations in times of crisis. Previous Previous post: A church in a gay area: how does that work?